Jamie McLennan offers us a back-up goalie's hilarious behind-the-mask look at life in the NHL in his first book, The Best Seat in the House: Stories from the NHLInside the Room, on the Ice and on the Bench . 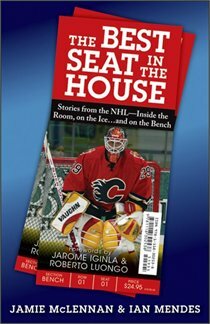 In his new book, The Best Seat in the House, career backup Jamie McLennan details his first meeting with goaltender coach Billy Smith. McLennan was playing in the minors for the Islanders at the time when the legendary Smith popped in to get a look at him. At the end of his first game, a rather strong performance, Smith called McLennan said: “I need to talk to you.” McLennan thought he was about to be praised for how well he played. Instead, he was read the riot act for allowing a minor league mascot in St. John’s to stand in his goal crease prior to the game. “I don’t care how many pucks you stop,” Smith said to him. “Don’t you ever let a $%^& mascot stand in your crease. If he’s there the next game, you %^^&$* run him over. Do you understand?” McLennan understood. The book, like McLennan, is full of these kind of gems from a very funny man.